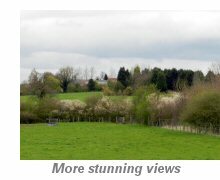 This delightful 5½ mile circular walk starts from the 15th century church of St John the Baptist, situated on the corner of the High Street and Beaudesert Lane in Henley-in-Arden. (It is usually possible to park for up to 4 hours at the top of Beaudesert Lane, but please check the restrictions). The walk takes us across mostly flat farmland with just a few gentle inclines. Very suitable for a gentle ramble before arriving back in Henley for some well deserved refreshment. 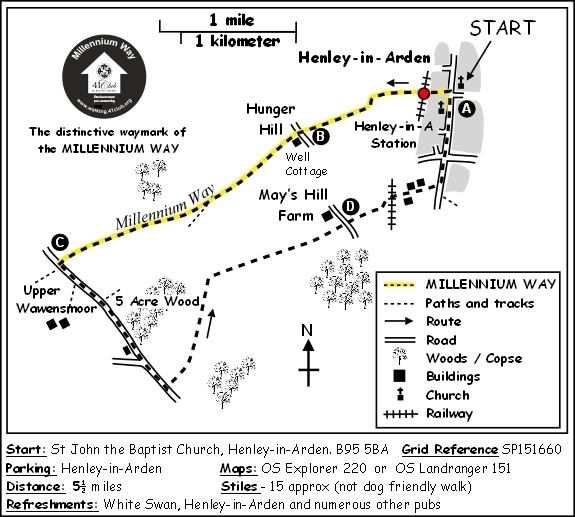 The first part of the walk incorporates an attractive section of the Millennium Way, where you will be guided by the distinctive black Millennium Way waymarkers. Find out more about the walk by clicking on the information icon. With your back to St John the Baptist church on corner of High Street and Beaudesert Lane in Henley-in-Arden we set off on the Millennium Way and go R (past the Guild House). After a few yards cross road at the pedestrian crossing and go L along High Street for approx 30 paces to turn R up alleyway signed to The Station. (You will soon see the distinctive black Millennium Way waymarkers to guide you along the first half of the walk). Stay up alleyway and through the car park of the Swan Pub. Continue following signs to Station (into Swan Croft). At the end of alleyway cross road bearing slightly L then go up slope on R to cross the railway bridge. Continue forward on fenced path with allotments on both sides and take metal kissing gate. Go ahead through further metal gate and then along tree lined passage to take another metal gate. Ignore kissing gate immediately on R and stay ahead with fence R to find footbridge with metal rails. Cross footbridge over ditch to kissing gate. Take gate and go ahead along enclosed field edge path with hedge on L and wire fence R and into sunken way up to stile. Cross stile and turn immediately L and up steps to reach field. Go R up field over summit, then ontinue down to takefence stile then further stile to road just opposite Well Cottage. Cross road then up drive to R of Well Cottage (take a moment to look down old well)and cross interesting stile in brick wall to R of gate. Go ahead over stile into small orchard. Continue forward over stile into paddock and cross another stile into field. Go 1/2 L down field keeping hedge R to field corner. Cross stile and go R down steps then L across culverted ditch to cross another stile then forward to metal footbridge over stream. Turn 1/2 R across field to pass marker post and on to stile in hedge. Cross stile and go 1/2 L across field to cross stile in fence enclosed hedge and continue 1/2 L to take another stile by gate in second fence enclosed hedge. (There is a commemorative wooden bench here if you would like to sit a while and enjoy the view). Go 1/2 R to cross stile and wooden planked footbridge over deep ditch. Continue forward to cross stile in next hedge and stay ahead towards field corner gap by solitary oak tree. Take gap and continue along field edge with hedge R. Go through gap in hedge at field corner and stay along next field with hedge R. At the field corner go through gap in hedge to reach lane. (Here we leave the Millennium Way). 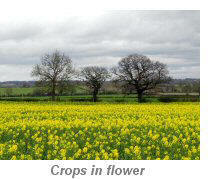 Turn L and walk gently up lane for approx 3/4 mile passing by the edge of Five Acre Wood. Continue past a farm to where a side road joins from the R. Ignore side road and continue forward along lane for approx 250 yds to take waymarked public footpath on L along track and stay ahead with hedge L. Where the hedge ends continue ahead on wide grassy path. Go through metal gate ahead and continue along with hedge R.
Where the hedge turns slightly R stay ahead to take mid hedge kissing gate just to R of tree. Stay ahead on the enclosed path to take next kissing gate into field. Bear R here and continue along field edge with wire fence L and hedge R. On reaching field corner go through metal gate and continue ahead on grassy track between tall hedges. Stay ahead past open hay barn to pass through next metal gate to T-junction of tracks. Cross over track and go forward to take metal gate then turning L to go with wire fence on your L. Continue along to eventually take stile to road. Cross road and take stile opposite continuing up slope with hedge and trees L.
At the top of the slope take metal kissing gate and ahead between wooden fences to take wooden gate just to L of farm buildings. Go ahead (but avoid walking into drive of private property) find and take small gate in fence, and then go a short distance with fence L to exit gate in corner. Take gate and turn R on track to cross railway bridge. Stay ahead on track to pass school building R until you reach the main road. Turn L on main road and when you reach the traffic lights go over crossroads and continue into Henley High Street. As you continue up the High Street back to your starting point you will find the famous Henley Ice Cream parlour on your L and this is always worth a visit. 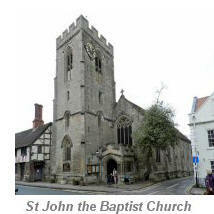 Soon you will arrive back at St. John the Baptist church. 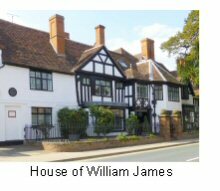 There are numerous pubs and restaurants in Henley for refreshments. Henley has had two railway stations. The present station, which we cross, was opened in July 1908 and is on the main line from Birmingham to Bristol and the West of England. The traditional station buildings are now boarded-up and a new ‘anti-vandal waiting shelter’ installed. A sign of the times? The route into the countryside, to Upper Wawensmoor, then returning past May’s Hill Farm, although a very pleasant walk, has little of historic interest. However, once the High Street is regained at the traffic lights, there are some significant buildings to note. The first to be seen, about 200m from the traffic lights on the left is The Yew Trees, a very fine grade II listed timber-framed house from 1579. 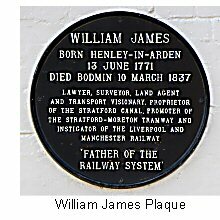 Look for the plaque to William James (1771–1837), a sadly neglected pioneer railway promoter, who was born in Henley. 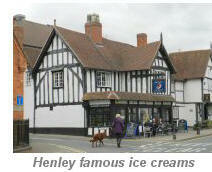 The famous Henley ice-cream shop comes next, on the corner of School Road. This 16th century building has served fine ice-cream since 1934. I defy you to walk past! 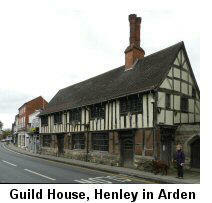 Henley Heritage Centre, (free entry) immediately after the ice-cream shop is a rare architectural gem. The oldest parts of the house have been dated to 1345. Displays and documents include an account of the development of the building over six centuries. The White Swan, a restored 16th century coaching inn opposite St. John’s church, ends the walk.